This dish all started with some Venison mince that I bought at the Farmers Market in Didcot one Saturday. Toying with ideas in my head I realised that I might give it a go in the smoker whilst cold smoking some cheese. Said and done, I gave it an hour in the smoker with some hickory smoke. The original idea was to make burgers out of the mince but the urge for some comforting mash came over me and it got changed into Hunters Pie. I was given the name for it when asking on Twitter. 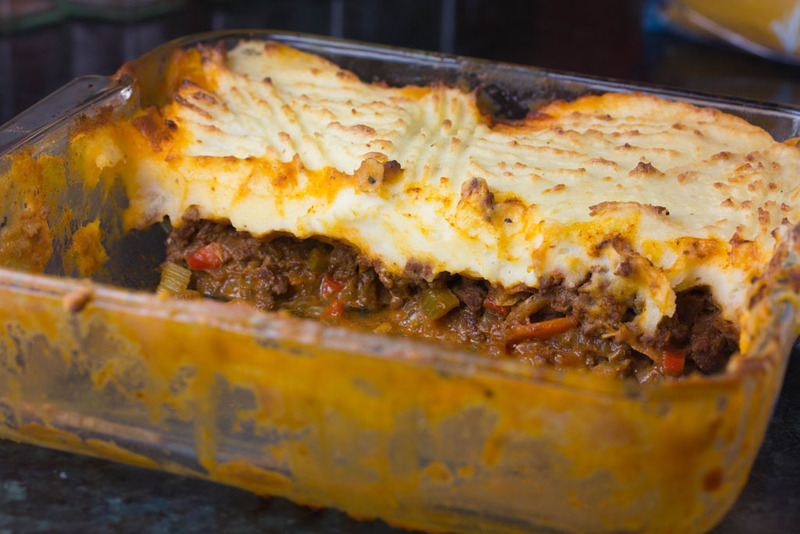 Shepherds Pie is made with lamb, Cottage Pie with beef and Hunters Pie with venison mince. Makes sense when you think about it. Next time I might actually give the mince two hours of cold smoke to infuse it even more. This time it had a nice, quite light, smoky flavour and for some reason I think it had taken away some of the game flavour from the meat. After one of my colleagues followed my example and cold smoked some beef mince for a chili we have had some discussions here at work as to if this could be dangerous for you. I took those questions with me to the Curing and Smoking course I recently attended at the School of Artisan Food. According to both tutors there, both very experienced tutors, this should not post any health risk as long as you cook it well afterwards. After learning that I'm sure there will be more smoked mince recipes in the future of this blog. If you don't have access to a smoker or can't get hold of any smoked venison - just make this with normal venison mince. It is a very nice dish and the game flavour of the venison is well worth a test. As always, freestyle it to your hearts content. After those words of wisdom, let's have a look at how to cook it. To make the mash, boil the potatoes until tender. Drain and mash, adding butter, cream and seasoning to your taste. Stir in the two egg yokes. Heat a frying pan on a medium heat. Add in the oil and the vegetables. Let the vegetables sweat in the pan until they start to soften a little bit. The next step is to put the mince into the pan. Let this fry until the mince is nicely browned. Stir in the Worcestershire sauce, beef stock, red wine and mustard. Season to taste. Bring the mixture to a simmer and let it reduce until you have a fairly firm consistency in the pan. Put the mince mixture into an ovenproof dish. Top with the mash and make some purdy patterns on the top of the mash with a fork. Pop it into the oven and cook for 20 - 25 minutes or until the mash starts looking nicely brown. You'll probably see some mince bubbling up at this stage. Remove from the oven and let it settle for 5 minutes or so. Låter verkligen rent otroligt gott! Tackar sa mycket! Det ar inte ofta som jag skryter over vad jag lagar, jag har mycket lattare att hitta fel an bra saker, men den har var jag valdigt glad over. En av sakerna som gick valdigt bra var att jag lyckades att fa till en valdigt tjock sas den har gangen. Det gjorde en stor skillnad. Jo, jag kor lite konstiga saker i min Bradley nu och da. Haromsistens snackade en mycket kunnig polare om att han hade rokt kaviar - tror det kommer att hamna i kammaren snart ocksa. Fiskpaj eller fisksoppa med rokt kaviar later gott. Glad you liked the name I suggested, Mike! And the dish looks wonderful! I've never been a huge venison fan, but I bet I would like it done this way. The red pepper, wine and Worcestershire would really accent the gamey flavor.